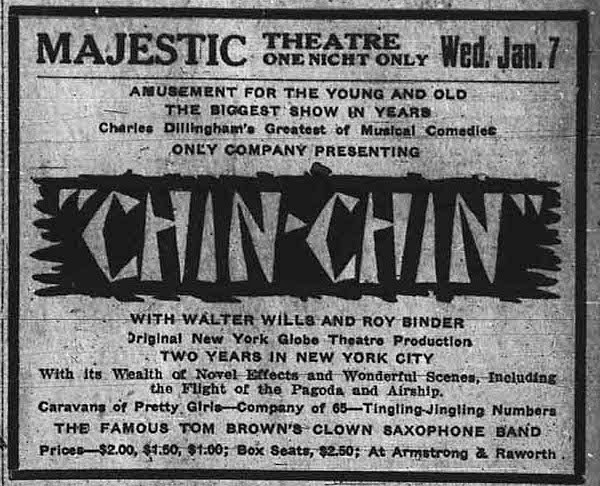 Once again, thanks to “Our Future Our Past” and their newspaper archive, we learn that “Chin Chin” played in Lethbridge, Alberta on January 7th, 1920. The pre-show advertising hype was certainly in place by January 3rd when an article about “Chin Chin” appeared in the Lethbridge Daily Herald on the “Drame – Vaudeville – Photoplays” page. The article mentions Ethey Lawrence as Violet Band but not our Donna. Ther is, of course, an ad for the show as well. In the paper the day before the show we see an article that explains how the girls for the show were selected and how some of the girls who couldn’t make the auditions had their “voices recorded on disk records” at various agencies and had the recordings sent to Charles Dillingham for consideration. 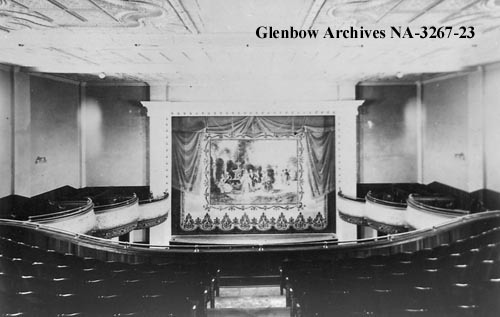 Although fairly small the Majestic Theatre was large considering the size of Lethbridge. With a population of 8,050 the theatre’s capacity was 1,150, That means that the theatre could held over 14% of the population of the town. As I mentioned, the stage was small, only 26×26 with footlights to backwall only 29 feet. The stage certainly looks small from the photo from high in the nose-bleed seats. The building was built in 1908 as the Griffiths Theatre. It became the Majestic in 1910 and Palm Dairy in 1938. It remained Palm Dairy until 1978 when it was destroyed by fire. Today a strip mall containing the “5th Avenue Dental Centre is at the location in a new building. Next stop for the “Chin Chin” cast: Calgary, 141 miles north by train. Our Past – Lethbridge Daily Herald, 3 January, 1920, Page 5.